Home › Mixed Martial Arts › Bjorn Rebney out at Bellator MMA……Good Riddance! Bjorn Rebney out at Bellator MMA……Good Riddance! 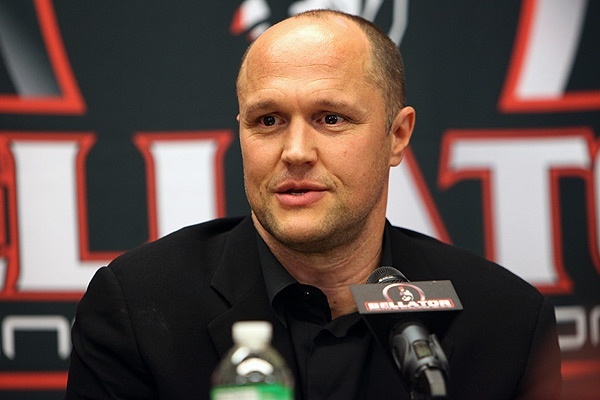 Viacom, the parent company of Bellator MMA, has announced that Bjorn Rebney, the founder and CEO of the promotion is leaving the organization effective immediately. The ink hadn’t even dried on the pink slip before former Strikeforce owner Scott Coker was announced as his replacement. I’m not ready to christen Coker as the messiah of Bellator, but the piss he took this morning is a better decision than most of the ones Bjorn Rebney made at the helm. There was always something scummy about the way Bjorn Rebney ran Bellator. He released Ben Askren, the company’s welterweight champion for being a “boring fighter” after spending the last three years promoting him as one of the sport’s elite. Rebney’s match making favored strikers over well-rounded grapplers which made me wonder why he didn’t just stick with Boxing. The Eddie Alvarez court battle showed Rebney’s true colors by using bullying contractual tactics and copious financial resources to stall out and bench the lightweight sensation in the prime of his career, thus forcing him to sell his house and costing him a lucrative contract with the UFC. Bjorn Rebney’s biggest crime is that his tournament format caused some amazing fights to never see the light of day, which has made Bellator, up until this point, a missed opportunity in the MMA landscape. Placing Babalu Sobral and King Mo Lawal on the opposite ends of a tournament, assuming they will meet in the finals, was an unnecessary risk. Why not just have them fight each other the first time out? No one cares about a “tournament final” tag on a poster. If they did, Bellator’s ratings would be a lot higher. The fact that Rebney kept a wash, rinse, repeat mentality with his vision while making no significant gains meant he wasn’t learning from mistakes. Viacom saw this and took swift action with his departure thus ending the Bjorn Rebney era. I hope that Bellator will flourish under the leadership of Scott Coker. While he’s respected in the space, he’s also been criticized for bringing in special attractions like Bobby Lashley and Herschel Walker. That works for me because these types of fighters always have their place on a card and they bring more eyeballs to the product. Another reason to be excited for Coker’s appointment is that he’s now partnered with Spike TV and they love MMA. Showtime never did much to promote Strikeforce or Elite XC. Coker already made some announcements at his inaugural press conference, including the removal of tournaments and weekly shows. This will breathe new life into the promotion because eliminating those elements ensures we will see the best fights and better overall events. Bellator 2.0 is upon us and Bjorn Rebney won’t around to screw it up. ‹ Do You Know About The ROH Pay-Per-View This Weekend?